Composting is the biological decomposition of organic materials by microorganisms under controlled, aerobic conditions to a relatively stable humus-like material called compost. Composting can happen in many different ways using a variety of materials, methods, equipment, and scales of operation. For agricultural operations the common materials or feedstocks that are composted are livestock manures and bedding and various residual plant materials (straw, culls, on-farm processing wastes, etc). Traditionally some farmers allowed manure to pile up and it decomposed until they were ready to use it. Some have referred to this as composting. Composting is much more than just aging manure - it is a science. The decomposition occurs in a well-managed process to obtain specific positive results - a valuable product - with a minimum of negative environmental impacts. The nutrient content of compost will be quite different from the manure and other feedstock that go into the mix. As water evaporates, the carbon breaks down and is lost as carbon dioxide, the compost volume decreases and the phosphorous and most other nutrients become more concentrated. Some nitrogen will be lost during composting and some will convert from readily available forms (nitrate and ammonia) to more stable organic forms that are slowly released to crops. It has been estimated that less than 15% of the nitrogen in compost (that has been applied to the soil) will be released in the first crop year compared to 50-60% for uncomposted dairy manure. The nutrient value of compost can be highly variable depending on the materials being composted and the composting system used. The finished volume of the compost is frequently 40-60% of the original compost feedstock volume. The compost process reduces the volume to be handled and transported to the field utilization site. It also concentrates many of the nutrients in the compost material compared to their concentrations in the original materials. Well-managed compost reduces odours and runoff moisture to reduce potential environmental hazards. Composting can quickly reduce the odour of the feedstock materials (manure, etc), sometimes within days of beginning the compost process. This can offer advantages for both storage and field application and has the potential to reduce conflicts with neighbours. Pathogens and weed seed viability are also reduced during the composting process. Pathogen reduction allows for the use of compost where food safety concerns are an issue. While most reports indicate good weed seed reductions with 2-3 weeks of high temperature composting, some reports have indicated that mallow, velvetleaf, smartweed and wild buckwheat species are among the hardest to kill. Composting is one of the recommended ways to handle mortalities on livestock farms. For more information on this topic see the OMAFRA Factsheet, On-Farm Composting of Livestock and Poultry Mortalities, Order No. 03-083. Figure 1. The composting process. Composting can create an additional value-added product that can be sold from the farm. The composting process requires optimum levels of carbon, nitrogen, oxygen and water. The feedstock materials that are being turned into compost must be well mixed into the optimum ratio of carbon and nitrogen (C:N ratio). The composting process must be aerobic. The particle size of these materials must allow for a good mix and maintain good airflow through the pile or windrow. Airflow is necessary to supply oxygen to the microbes that will be active in the compost and to release the carbon dioxide and other gases that are generated in the decomposition process. Water is required to maintain the life functions of the microorganisms in the compost. Excess moisture will reduce the airflow and the compost will cease to be aerobic. During the composting process, heat, water (H2O), carbon dioxide (CO2) and ammonia (NH3) are released into the air. Ammonia losses are greatest with high temperatures and low C:N ratios during the first few days of composting. There are also some losses of methane (CH4) and nitrous oxide (N2O) if anaerobic conditions or pockets develop. Most plant or livestock materials contain some carbon and nitrogen. Feedstocks containing a high ratio of carbon to nitrogen (C:N) are sometimes referred to as carbon materials or bulking materials since many are coarser and allow for better aeration. Feedstocks with low C:N ratio may be referred to as nitrogen materials in the compost mix. Frequently several materials need to be mixed in appropriate proportions to achieve the optimum C:N ratio and moisture to make good compost. The following table gives examples of materials that can be composted and typical C:N ratios for these materials. Note that these are examples and that the C:N ratio will vary with the specific material. An analysis of your materials will help you to get the correct ratio. The optimum range of C:N ratios for composting are often reported to be 25:1 to 30:1 but can range from 20:1 to 40:1 depending on materials and conditions. When using wood chips as the bulking material, the optimum C:N ratio may be slightly higher because woody materials contain more lignin and are very slow to break down. Optimum moisture levels are 50-60% (by weight) but ranges of 45% up to 70% can be used under some conditions. Livestock manure is a common material to be composted on the farm. The nutrient content and the C:N ratio of manure is highly variable, depending on livestock and management practices - species, feed ration, bedding, etc. 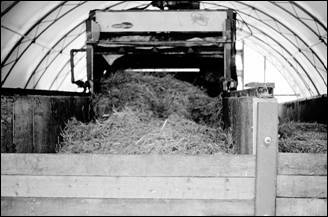 Frequently, manure from modern farming enterprises does not contain enough bedding to be able to compost readily. Options are to either add extra bedding in the barn or to mix the manure with high C:N ratio materials (such as straw) in the compost windrow. Fruit and vegetable wastes may need to be mixed with other materials to balance the C:N ratio and to bring the moisture to appropriate levels when composting. Liquid materials cannot be composted alone but can be blended with dry materials before composting to obtain optimum moisture content range. Do not add liquid materials such as manure after the heating process has been completed since that would reintroduce potential pathogens into the compost. The choice of input materials for composting may depend on the final use of the compost. The materials used will influence the nutrient analysis of the mature compost product. Some markets may not allow or want some materials in the compost. When using off-farm materials, there may be additional permits or regulations to be followed. Check with your Ministry of Environment and local municipal office for more details. Choose the composting site carefully to reduce the potential for environmental impact and to respect neighbouring land uses. Water management and airborne emissions are the primary risk factors when composting. Both on-site and off-site water runoffs must be addressed. Select and manage sites to minimize runoff from the compost piles and surface runoff water from entering the site. Do not allow contaminated water to leach into soils. Odours are usually a primary cause of friction with neighbours. Odours need to be managed especially when using odorous materials. Poor pile management will also result in odour emissions. Even well managed piles can result in some odour or ammonia emissions. Some materials attract rodents, birds and insects and strategies may be needed to reduce vector attraction and alleviate impacts to neighbouring land uses. In larger composting operations noise and traffic may also be concerns. One of the keys to successful composting is to work with your neighbours to reduce the potential of future problems. Locate piles/windrows on slightly sloping land (0.5%-3%) with the windrow up and down the slope. This allows for runoff to be managed. Divert runoff from land upslope with berms or curbs away from the composting site. Direct runoff from the site to a runoff catchment area or earthen containment and then reused to add water to the compost when needed. Filter runoff with a vegetated buffer zone or other appropriate treatment method. Ensure the surface of the composting site is adequate to reduce the leaching of compost runoff and seepage from the compost. Sites must not be located close to wells or other water sources. Do not locate composting sites near tile drains or on light (sand) soils. Permanent composting sites have similar siting requirements to manure storages with respect to neighbours, wells, water etc. In addition to having suitable sites for the composting process it is also imperative to have appropriate sites for the safe storage of the compost during the curing process and storage of the mature compost. 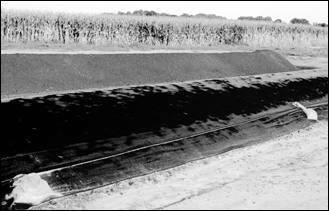 Appropriate coverings as well as runoff controls may be needed. The actual design of the appropriate composting system for any given situation will vary and more detailed information and design criteria may need to be developed by local engineers and other professionals with expertise in composting methods. Success with any composting system will require management skills and these will be honed with experience. Compost managers should tour other similar facilities and compare notes with others to learn from their mistakes. If possible start small and expand as needed. Windrow/pile composting is the most common method for on-farm. Piles are generally for small quantities of materials. Windrows allow for more material to be composted in a geometrical shape that allows for air to circulate into the compost. Windrows are commonly 2-4 m wide and 2-3 m high at the start of the composting process. Windrow size may be predicated by the size of your windrow turning equipment. Larger windrows will have more problems with airflow unless they are aerated. Passive aeration is when there is only a natural circulation of air into and out of the windrow. Air has difficulty moving more than 1-2 m through the compost material. Wet materials and low porosity materials (example: finely chopped) reduce this distance. Active aeration involves a mechanical system (example: fans) to force air into the windrow or to pull air out of the windrow. Usually there are fans attached to a system of perforated tubes (example 4 in. drainage tile) under the centre of the windrow in these systems. Turning is the mechanical agitation and mixing of the windrow or pile to mix materials from the surface into the centre of the windrow. Turning also adds air to the windrow and allows an opportunity for moisture management. Turning can be done with tractor loader equipment or with specialized compost turners. There are several advantages of turning the compost windrow. Thorough turning will ensure that there is a uniform mix of the feedstock materials throughout the windrow. This reduces the likelihood of hot spots where there is overheating or accumulation of high moisture materials that reduce microbial activity. The frequency of turning can be managed to respond to changes in moisture or temperature as required. The moisture content of the windrow usually decreases after turning. If the compost has become too dry water can be added when turning to increase the moisture within the windrow and to increase the composting activity of the microorganisms. Turning adds air spaces and oxygen in the windrow. Figure 2. Manure spreader setting up a compost windrow. Turning at regular intervals during the initial 2-3 weeks of composting is advisable to reach and maintain temperatures above 55°C for 15 days. This temperature is known to kill most pathogens and weed seeds. Proper turning will mix materials from the surface into the middle of the windrow. This increases the probability that all materials in the windrow are exposed to temperatures high enough to kill pathogens and weed seeds. A poor mix will leave some surface materials on the surface. This can result in recontamination of materials that have been heat treated within the windrow and increase the survival of pathogens. After turning the compost, the temperature of the compost will increase due to the increased levels of oxygen that stimulate microbial activity. The temperature will increase rapidly within a few hours and then slowly decline. Oxygen levels will rise immediately after turning and then decrease and stabilize within 1-2 hours. Figure 3. Turning compost windrow, note the warm moist air escaping. To maintain optimum microbial activity, optimum moisture content must also be maintained. When compost is too wet, the turning will mix the materials, increase the aeration of the windrow, stimulate higher temperatures, and increase the evaporation of moisture from the windrow. Turning too frequently can make the material too dry. In the summer, evaporation can also occur and dry out the compost below the optimum level. When compost is too dry moisture can be added during the turning operation. The windrow should also be peaked at the top (triangular) to shed most of the rainwater. During drier months having a flat-topped windrow or having a slight indentation on the top will trap some rainwater. Covering the windrow with a semi-permeable covering will shed some rainfall during periods of low evaporation. Covers must be made of a material that allows the infiltration of oxygen and the release of carbon dioxide, water vapour and other gases. Common materials include geotextiles. Windrow dimensions must be sized according to the equipment being used for the turning. As a general rule, windrows should not be higher than 2.5 m (8 ft) or wider than 3.6 m (12 ft). Air movement into larger windrows will be reduced. Leave adequate space between windrows to allow for the movement of the turning equipment. Ensure accessibility of fire equipment in the emergency situation of spontaneous combustion or other fire issues. Figure 4. Two compost windrows, the front one is covered with a semi-permeable textile cover. The tractor-loader is the simplest system for most small farm operations. The loader is used to lift and turn the windrow over into the space immediately adjacent to the existing windrow. The disadvantage is that there is frequently less than adequate mixing and chunks may not be broken up thereby reducing the amount of aeration. The outside of the existing windrow may not get turned into the middle of the new windrow making pathogen kill less efficient. Using a tractor-loader can be time consuming (high labour costs) for large quantities of compost. There are extra space requirements to use a tractor and loader and may require windrows to be located endwise instead of side by side. The tractor-loader plus a second tractor with a manure spreader can be used to get better mixing and aeration of the compost. The loader fills the spreader, which is used to discharge material to create the new windrow. The main disadvantages are extra equipment and labour costs and there is still the risk of pathogens being transferred to the outside of the windrow. The best system uses compost windrow turning equipment that is designed to turn windrows efficiently and turns the materials in a way that moves material from the outside of the windrow to the centre of the new windrow. Some compost turners also have optional equipment to add water during the process or to lift and replace windrow covers all in one operation. Compost turners have the capacity to turn compost up to ten times faster than a tractor loader system. The main disadvantage is the cost of the turning equipment, which may include modifications to the tractor transmission to allow for high power at very low speeds (creeper gear). Take care not to turn the windrow too frequently since the turning process tends to mechanically break down particles, and if turned too frequently particles can become too fine, reducing the porosity and the natural air movement through the windrow. Frequent turning may also increase the loss of nitrogen from the compost. When the compost is being used on farm and the time to finish the compost is not limited the frequency of turning needs to be examined. Frequent turning decreases the time to finish the compost and it creates the conditions for quickly reducing pathogens and stabilizing nutrients, but it also increases costs dramatically. The reasons for composting and the cost of turning need to be balanced to create cost-effective compost. Active aeration of windrows requires more careful design for appropriate airflows, and usually a more expensive system than turned windrow systems. The most common design of this system is to place aeration pipes along the length of the windrow with adequate holes for proper airflow. The pipes and middle portion of the base of the windrow is then covered with a porous material such as wood chips. The windrow is then placed on top of the aeration bed. Proper mixing of the feedstock materials and optimum moisture contents are critical to success since these windrows are usually not turned (therefore not disturbing the aeration system). Fans are attached to the ventilation tube and air is either blown into the windrow (positive pressure) or vacuumed out of the pipe (negative pressure). When using a negative pressure, biofilters may be needed to remove the odours from the exhausted air. The aerated windrows also need to be covered with an insulated blanket of material to allow adequate heating of the surface of the materials that need to be composted. This covering is frequently straw or mature compost and is 6-12 in. thick over the whole windrow. Another design of this system allows for a windrow to be established on a concrete pad that incorporates a ventilated floor and air plenum down the length of the centre of the pad. This reduces problems with setting up air pipes when establishing the windrow and permits the optional turning of the windrow to enhance mixing and temperature/moisture management. The aeration system can be either mechanical or passive, depending on the design. Aerated windrows can either be long narrow single windrows or they can be designed to put adjacent windrows immediately beside each other to form a continuous pile. Design is especially critical to maintain adequate airflow. Sometimes known as PAWS (Passive Aeration Windrow System), this system involves the insertion of aeration pipes into or under the pile. The feedstock materials are usually piled on a bed of coarse material such as wood chips and/or aerated pipes to improve aeration. The air is permitted to flow passively through the pipes and the coarse material under the pile. PAWS allows better aeration than the static piles and can achieve higher temperatures, but can be subject to many of the same problems especially if the mixing is inadequate or if the feedstock materials are of improper C:N ratio or moisture. The aeration pipes make it difficult to turn the piles as a means of correcting problems such as hot spots. As a result the degree of composting may vary throughout the pile. This is a very low management system where you pile it and leave it. While it is the easiest and least expensive composting system, it can also be the most troublesome and produce the poorest quality compost. When there is no turning of a windrow, the uniform mixing of feedstock materials and the moisture content going into the windrow are very critical. There needs to be enough void space (porosity) in the materials to allow air to penetrate the windrow. Water is released as the feedstock breaks down, but if there is insufficient airflow, this water goes to the bottom of the pile creating anaerobic conditions near the bottom of the pile. This problem is increased if the windrow is not covered to prevent the inclusion of rainwater. 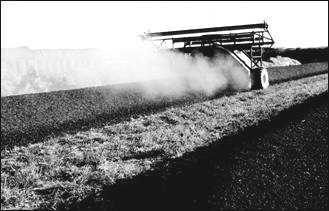 Under hot, dry weather conditions, the surface layer of the windrow can become too dry for microorganisms to work effectively. Turning the pile would mix it to create more uniform moisture content throughout the windrow. Windrows that are not turned and do not have mechanical aeration systems, frequently do not reach adequate temperatures to kill pathogens and weed seeds. This is especially true in anaerobic zones within the centre of the windrow, as well as near the surface of the windrow, where temperatures are well below the temperatures required for pathogen kill (55 ºC). Piles should not be too large. Larger piles will not allow air to travel through the pile since air can only move passively 1-2 m in the material (depending on porosity and type of material). When the compost becomes anaerobic there is a potential for odours to become a problem, especially when it is loaded or mixed. If the compost is saturated, water can seep out of the windrow to create surface water runoff or leaching issues. In-vessel composting systems include a group of composting methods. They have the greatest amount of design requirements. They range from concrete channels with mechanical mixers to rotating steel drum type systems. Many are continuous flow and designed for high capacity commercial composting operations. Frequently they are contained in buildings designed for the purpose. High initial cost and continuous management are disadvantages. They are usually used for high volume or central composting systems and require a higher level of management than other systems discussed here. Some designs use rectangular concrete channels that may have aerated floors and be turned either with turners that travel on overhead rails or in some on-farm cases by using multiple channels and tractor-loaders to turn and move the material from one channel to another. Figure 5. Small in-vessel compost system showing turner in channel. The simplest of the in-vessel systems use small bins made of wood or sometimes concrete that may be turned infrequently and use passive aeration from the sides or below the bin. They may be located in a roofed structure. An example description of these bins can be found in the OMAFRA Factsheet, On-Farm Composting of Livestock and Poultry Mortalities, Order No. 03-083. Vermicomposting is worm composting. Common worm species for this type of composting are Eisenia foetida and Lumbricus rubellus. These are sometimes called "red wigglers" or manure worms. These worms are added to the feedstock materials to assist in the decomposition of the organic matter and transform it into worm castings. This type of composting does not reach high temperatures but research is showing that there can be good kill of pathogens and weed seeds. Composting using static piles is potentially more problematic. In-vessel systems have more management and design requirements and are frequently too expensive for typical on-farm composting facilities. The most practical systems for on-farm composting are usually the turned windrows, aerated pile or aerated bin composting systems. Turned windrows require more labour than aerated piles and may require some daily activity during the active stage. Operating expenses are also higher than for aerated piles, depending on available equipment and the frequency of turning. Aerated piles require less land and usually have lower nitrogen losses than windrow composting. Aerated piles can be located in buildings to reduce weather factors. The design and maintenance of the airflow system, potential odour management, and the need to have excellent mixing and appropriate C:N ratios at the start, are pitfalls of aerated piles. Aerated systems also require a power source whereas windrows can be located in remote locations on the farm. Active or Thermophilic phase - This is the phase when the most rapid breakdown of materials occurs. After the materials are mixed and the pile is created, temperatures rise (above 45ºC) and decomposition is done by aerobic, thermophilic, organisms including bacteria, actinomycetes, fungi and protozoa. The microorganisms use oxygen to consume the feedstock materials and respire carbon dioxide. Temperature and moisture beyond the optimum ranges (40-60ºC, 50-60% moisture) or low oxygen levels will reduce biological activity. High moisture levels reduce oxygen. Low moisture levels can result in temperatures rising too high. The time required for the active phase will depend on the materials, ambient air temperatures, and the composting method. In-vessel systems with turning and aeration can offer the shortest times. A composting windrow with frequent turning may have an active stage as short as 1-4 months, or up to 4-8 months with less frequent turning and 6-24 months for passive composting with no turning and no active aeration. Curing or Mesophilic stage - after the main thermophilic phase most materials have broken down and are not recognizable from their original form. Temperatures are more stable (usually less than 40ºC) even after the pile is turned. In this stage there is a shift in the organism populations to those that prefer lower temperatures. Turning is not needed but compost should remain aerobic. In the curing phase, compost is not yet mature. Immature compost may have higher levels of organic acids, high C:N ratios, extreme pH values or high salt contents all of which can damage or kill plants. The time to cure may vary up to a year but is generally less than 3 months. Maturing - compost needs time in storage to mature. Maturity is an indication of the degree of humification or the conversion of organic compounds to humic substances that are resistant to microbial breakdown. There are various tests for compost maturity. Lab tests can be used or germination tests using lettuce or cress seeds can be used. Immature compost may injure the germinating seeds and plants will not survive. During the maturing phase pile size is less critical than during the active or curing phases. Material can move from storage to utilization when convenient but should be utilized as soon as possible. The ability to make good compost starts with a good recipe and with your ability to monitor the compost and respond to changes as they occur. Many operators suggest there is "an art to composting". Good records can help you to improve your compost quality. It is important to keep records of the feedstock materials being composted, C:N ratios and approximate moisture content at the start of the composting process. 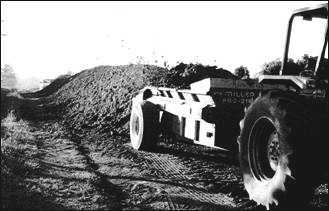 Records should also include when the compost was turned and the conditions of the compost at that time. Temperatures need to be monitored regularly. Some standard operating procedures require daily temperature recording during the active phase, to ensure that the required temperatures have been achieved. It is recommended that the thermometer has a one metre (or three-foot stem) with a 0-80 ºC temperature range, and be inserted into the centre of the pile in several locations at each monitoring event. Make notes of moisture condition and any odours. Foul odours may indicate anaerobic conditions or lack of oxygen. Ammonia smells may indicate high nitrogen content (C:N imbalance) and a need for more carbon material. Additional records and sampling may be required when composting permits are required, such as when off-farm materials are added, or when selling compost as a soil amendment or fertilizers.